No appeals being filed against a proposed $700 million KeyArena renovation project by last week's deadline means opponents can no longer block it. Look for the NHL and Seattle City Council to work through remaining issues and a hockey franchise to be granted for the 2020-21 season. 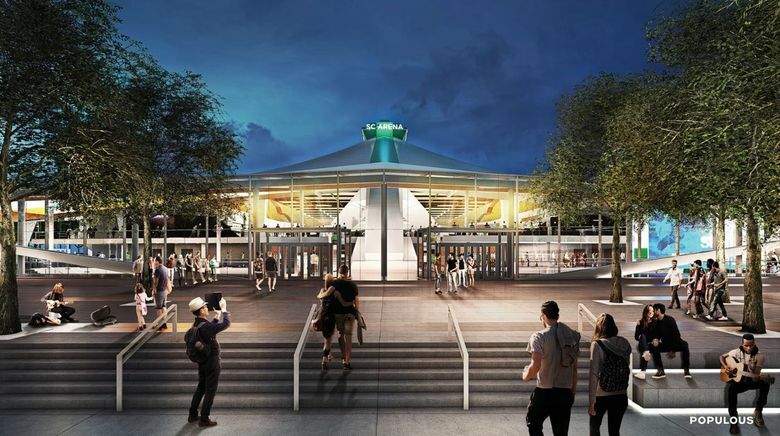 The most important vote in getting a $700 million KeyArena renovation and a $650 million National Hockey League expansion franchise approved has already taken place. Sure, there’s a remaining Seattle City Council vote Sept. 24 on ratifying the renovation deal, then an NHL executive-committee meeting Oct. 2 followed by a potential league board of governors vote in December on awarding the hockey franchise. But make no mistake: The biggest vote in favor of both the renovation and future team was the one decided last Thursday by nobody casting a ballot. That was the final day for anybody to appeal an environmental study of the proposed arena renovation. And the silent abstention that greeted the appeal deadline as it passed effectively eliminates any chance of the KeyArena plan or NHL bid being quashed by opponents. Instead, any torpedoing of either plan now would be from friendly fire alone. Both the Seattle City Council and NHL have long fought to get these respective arena and team deals on the table. And they alone now control their fates. It has taken a long time to get here. The Los Angeles-based Oak View Group (OVG), in beating back a bid by the Seattle Partners last year to gain the KeyArena renovation selection, also fought off a prolonged public-relations campaign by a group looking to build a new arena in the city’s Sodo District. You could sense the relief Friday at a meeting of the city council’s Select Committee on Civic Arenas. All along, there’d been a fear somebody would appeal and block the KeyArena project at least three months until the City Examiner’s Office determined whether the protest was frivolous. OVG built a three-month contingency into construction plans to deal with a frivolous appeal, start work in December and still finalize the renovation by the October 2020 start of that year’s NHL season. But a more serious appeal – involving issues directly impacting local stakeholders – could have delayed things longer and the NHL launch until at least October 2021. That would have been a tougher sell to the NHL executive committee in a couple of weeks. So, OVG and the NHL Seattle group – which has applied for the hockey franchise – spent the past few months mitigating issues directly with stakeholders to ward off serious appeals. “I worked on it intensely and our hard work paid off,’’ NHL Seattle president and CEO Tod Leiweke told me moments after Friday’s meeting ended. Leiweke said the lack of appeals means years of local arena frustration are about to end. Seven of nine council members attended Friday’s meeting and unanimously pushed the project forward, meaning any chance of the Sept. 24 vote going against it seems nonexistent. The council, having commissioned a study four years ago on KeyArena’s future, has found a partner willing to privately renovate the city-owned building – saving taxpayers at least $150 million on alternative uses — import major pro teams and share revenues. And the NHL, having long prodded this city to get an arena – with commissioner Gary Bettman meeting personally with elected officials here in 2014 – will finally have its desired U.S.-based, Pacific Northwest gateway franchise. Given our region’s years of underfinanced arena plans, unfulfilled promises of teams and vanishing investors, both the NHL and council are understandably still leery. The league wants to see KeyArena dirt moving before granting a team and the council won’t allow construction work until the franchise is awarded. But make no mistake: Both want an NHL team in a remodeled KeyArena by October 2020. The council is protecting itself in case the NHL gets cold feet over a potential lockout in 2019 and delays awarding the franchise. But that won’t happen. Even an NHL owner preparing for a lockout would prefer their $23 million cut of Seattle’s $650 million expansion fee right now to help ride out any future work stoppage. And if you’re the city, knowing a December launch of KeyArena construction is tight, you’ll grant waivers to start sooner as long as the NHL executive committee gives a favorable nod in two weeks. Not once has the league’s board of governors voted down an expansion recommendation by the executive committee. City council member Sally Bagshaw told me after Friday’s meeting there’s flexibility in the construction restrictions if the NHL sends the right signals. The council, she said, wants this renovation and a revenue-generating NHL team as quickly as OVG does. The council requiring a team before allowing construction – even as a soft restriction – also could head off future attempts by entrepreneur Chris Hansen to obtain part of Occidental Avenue South from the city for his stalled Sodo project. Hansen’s prior deal collapsed largely because he failed to demonstrate he could land NHL or NBA teams. Forcing Hansen to show proof of a team before the council would consider “vacating” Occidental and reviving his Sodo plan would likely eliminate years of unnecessary political squabbling. If Hansen proves he can bring a team in – with a commitment from either league – that’s different, and his street application could be revisited. But given this city is about to approve the equivalent of a new arena under the existing KeyArena roof, the onus is now on Hansen and his supporters to demonstrate either league would side with him at a different venue. Up to now, they haven’t. Right now, there’s one arena plan with money to start construction and owners willing to pay for a team as soon as the NHL agrees. And after last Thursday’s no-show by opponents, the only people who can stop it are the ones most wanting it to happen.